If you are logged into your Google My Business account and you do a web search for a business you have ownership of in Google, Google will let you edit the listing right in the local knowledge panel. That isn't new but what is new, it seems there are an increase in reports of Google showing the wrong business name in that local knowledge panel but when you edit the listing, it shows the correct business name. This was reported at the Local Search Forums and I confirmed it. 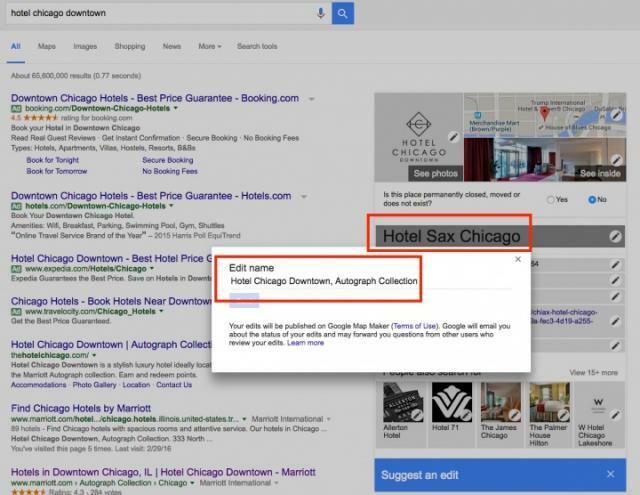 A search for [Hotel Chicago Downtown, Autograph Collection] returns the name "Hotel Sax Chicago" in the knowledge panel but the real name, as it is listed in the real listing is Hotel Chicago Downtown, Autograph Collection as the search query showed. I assume this is some weird bug.